Hm...quite strange if I do say so myself. It looks like that even the drawn artstyle of Mega Man himself looks like the classic drawn original Inafune style Rockman, if you look at the pic of him standing. I'm glad they used the retro artstyle and not the usual Zero/ZX series artsyle that Inti Creates usually uses. Not against the Zero/ZX artstyle, but it doesn't fit the retro 80s/90s style classic Rockman. The black Megaman is most likely one of the reported Megaman shadow clones that are fought in one of the stages. It's a shame that the US never gets any of those subtitles for Mega Man games. Look how awesome they are! Rockman 3: Dr. Wily's Time to Die!? 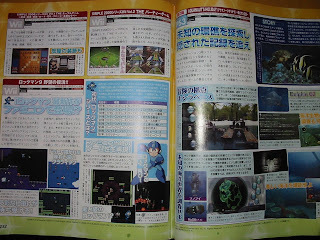 Rockman 4: A New Evil Ambition! Rockman 6: The Biggest Battle in History! !